Idle welcomed Alwoodley Reserves to the Sutton Avenue fortress for the first home game of the 2017/2018 season. The conditions were a complete contrast to the opening day with glorious sunshine replaced by torrential rain for the majority of the preceding week. It would certainly be a day to test that first touch! Confidence was high after the opening day victory over Garforth and the home side had another strong squad to pick from with James Royal returning the fold along with Danny Rosconie and Danny Parkinson all back in contention. The starting XI was almost identical to the Garforth game with the only change seeing Lee Cookson start the game in place of the absent Carl Brown at centre back. Yet another customary slow start from Idle saw the visitors press high and apply a lot of early pressure. However, the Idle defence coped well initially with Cookson, Jamie Allen, Luke Gray and Tom Holmes dealing with the majority of the attacking play with Marcus Strudwick showing safe hands between the posts. Idle grew into the game throughout the first half and began to dominate the ball. The opening goal came from a swift counter attack with Adam Medley and Aaron Irving combining well before Ryan Mitchell found time and space at the back post to slot home. The lead was quickly doubled as Irving grabbed a goal of his own. An early penalty was awarded to Idle after some suspect defending from Alwoodley lead to a foul in the box. Irving stepped up to take but the Alwoodley keeper managed to guess right, pulling off a strong save to keep his side in the match. The momentum quickly shifted in Alwoodley’s favour who managed to get back into the game after a short free-kick wasn’t defended properly and the forward smashing the ball past Strudwick from the edge of the area. Idle went into the half-time break with a slender 2-1 lead despite having the majority of the chances. The Idle lads knew there were still a few proverbial gears to go through and the second half started brightly for the home team with Medley scoring the best goal of the day. The winger cut in from the left-hand side and with space opening up in front of him, struck the ball sweetly into the top corner from 20 yards out. It was the early goal Idle needed and set the tone for the second half. With Idle dominating the game, the heavens opened again and the downpour made it a little more difficult with the ball zipping off the surface. However, the conditions did make for some fantastic Sol Campbell-esque, never-ending slide tackles! The fight from Alwoodley seemed to wash away with the weather and Idle maintained their level of dominance putting daylight between the two sides as Tom (Tim?) Simonett added to the away sides woes with two goals along with Irving scoring another two to make up for his earlier penalty miss. Although, Simonett seemed to channel his inner Sadio Mané (Was it a red car? Anyone who wants to debate that see Marcus who’ll be happy to tell you you’re wrong!) with a high foot for one of his two second-half goals. With Idle maintaining a comfortable lead, Manager Rob Brook made a couple of substitutions with Royal, Rosconie and Parkinson entering the fray. Royal made an immediate impression with his pace and strength causing the Alwoodley defence all kinds of problems. He was eventually rewarded with a goal, breaking the offside trap and one-on-one with the keeper, he curled an effort high into the top corner to conclude the scoring for Idle. 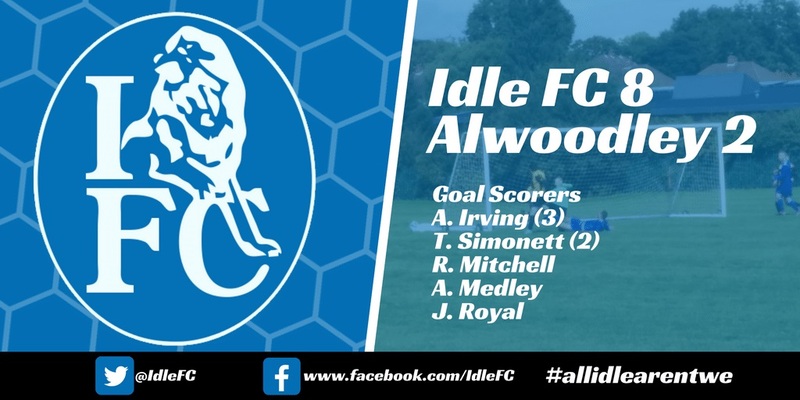 It was a dominant second half from Idle and one where the lads upped their game and put the Alwoodley defence to the sword with slick passing and movement and some individual pieces of brilliance. Another 3 points and plenty of goals puts Idle into 1st place in Division 1 but there’s still lots of work to be done and some old rivals to face!